If you are a lover of avocado then you will really enjoy this twist of Avocado Deviled Eggs. The creamy and smooth texture of the avocado provides a wonderful compliment when mixed with the egg yolk. Deviled eggs have been a staple of many family gatherings and party potlucks. Changing up your classic deviled eggs by adding new ingredients such as avocado, will tickle everyone’s taste buds and start the conversation rolling. The green coloring is a fun addition to theme parties, such as St. Patrick’s Day or a Dr. Seuss theme. 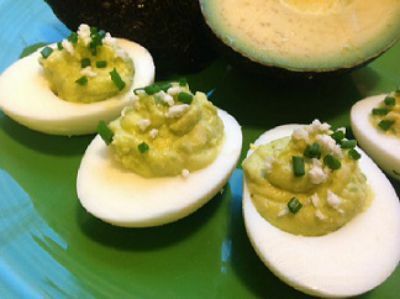 My daughter loves to prepare these avocado deviled eggs and serve alongside classic deviled eggs and Sriracha deviled eggs for a brunch or holiday dinner. Be prepared to share this recipe, bring a copy or share our web site with your friends. **Time saving option- Prepared guacamole can be substituted for fresh avocado. Cut peeled eggs in half lengthwise. Transfer yolks to a bowl. C over and chill yolks and whites separately for 1 hour. In a large bowl, mash the yolks with a fork and set aside. In a separate bowl mash the avocado into a paste like texture (lumps are ok), then stir in the lemon juice. Combine the mashed egg yolk and avocado together. Mash in the mayonnaise and ground mustard; stir until well blended. Salt to taste. If needed add a little more mayonnaise to add more moisture to mixture. When ready to serve, garnish the tops of each deviled eggs with minced chives and finely crumbled cotilla cheese. NOTE: The stuffed eggs may be made 1 day in advance and kept covered and chilled. I started mashing the yolks of 7 aggs and forgot about using avocado. I’d already added mayo and Gulden’s mustard (didn’t have any yellow on hand), but it was still a bit thick and I was gonna add more mayo. Then I remembered the spicy guacamole I bought last week. I opened a 2 oz. tub and mixed in a spoonful. Tasted good so I added the rest, then some salt and a touch of pepper. I don’t have any paprika here, so I topped ’em with cayenne pepper. I kinda miss the tang of yellow mustard, but they turned out alright and are a good alternative. Loved your idea of using prepared guacamole with yolk mixture!! Suspect the seasoning from guacamole saved time as well. i can hardly wait to try it……THANKS for sharing! Loved this recipe! It was a hit for St. Paddy’s Day. Thank you. I am a diabetic and avocados are a “Super food” for the nutrients. Since I love deviled eggs as an occasional snack, adding the avocados is going to make them extra special for me. I can’t wait to try them out! Any holiday will work, even Easter!